A week ago today I jumped on a motorcycle and headed to the mountains with a couple of good Haitian friends. They had been telling me of a tiny village up there where there was great need. So I said let’s go. The road was brutal all the way up. When we finally got close we parked the bikes and walked toward a stand of mature mangoes where we heard some commotion. In the cool, dense shade of the trees were gathered a bunch of young children. The ground was dense with old and brittle mango leaves. It was impossible to walk quietly. 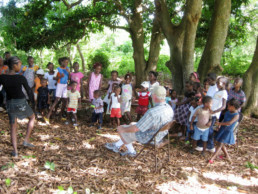 I learned that the children gather here under these trees about three times a week to sing and play and to be read a story out of a Bible story book. I later learned that there is no school here (Mare Koshon they call it) and that they fetch their water from about a mile away. I did not see much in the way of garden crops or animals. No electricity, of course. 91 homes. They told me they had a church but I didn’t go to see it. They told me there had never been a medical or dental team come to their village. The woman whose land the mango trees were on was 85 years old. Her name was Madam Diwork. Born, I calculated, around 1926. Man. Her deep wrinkles betrayed her hard life. 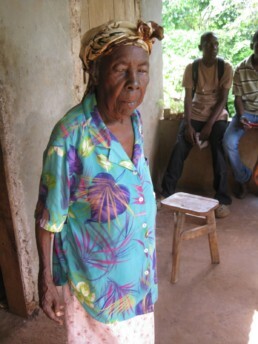 She had defied the life expectancy odds of living here. I wondered what all she had seen. They tell me Mare Koshon means “standing water where the pigs go to” and they walked me to a field that for some reason, did not drain water well even though we were at some altitude. It was boggy with a fair amount of standing water. I never saw any pigs. I have a few videos of my time there and I’ll post them when I figure out how. You will enjoy them, I’m pretty sure. You can’t find Mare Koshon on a map. I figure that’s because it’s tiny, plus no one much knows its there. But now I know it’s there. My time there was one of those alive, exhiliarating, pinch me experiences you have every so often. Mare Koshon is a precious place with precious people whose needs are basic and severe. I figure I’ll be back. Probably soon.